The next gripping psychological thriller by the author of How I Lost You, Jenny Blackhurst’s #1 international bestseller, about a psychiatrist and patient relationship that turns not only toxic…but deadly. Before I Let You In by Jenny Blackhurst is a psychological thriller that switches the point of view between three friends and an unknown threat. This book was one that as soon as I began reading I got totally caught up in and didn’t want to put the book down until the very last page. Karen is a psychiatrist who has taken on a new patient that she begins to suspect has ulterior motives for choosing Karen as her doctor. Bea and Eleanor have been Karen’s best friends since childhood with the three being as close as friends can be. Eleanor is the married mother of the group and Bea is the carefree single lady, or so she let’s her friends believe. Karen’s new patient comes in with claims that she’s in a relationship with a married man but she refuses to let Karen lead the sessions as she normally would and only drops hints as to her motives for being there. Karen begins to suspect that this patient is a danger to herself and her friends when events begin happening to the ladies that her patient hints to being responsible for. 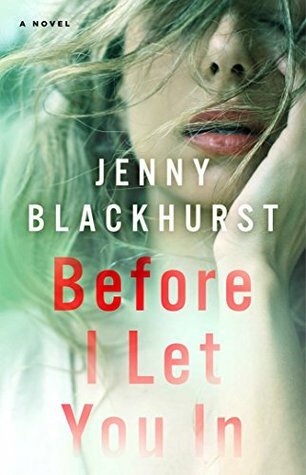 Having read another title by Jenny Blackhurst I was really excited to dive into Before I Let You In and thankfully it was one that lived up to my expectations with writing that was easy to lose myself into for a few hours. There is plenty of drama in the lives of this trio of friends to become completely invested in as the author begins to twist the story to keep a reader on their toes until that very last page. Definitely recommend this one to the psychological thriller fans out there. Sounds like my kind of thriller. Glad that you enjoyed this one, Carrie. I will definitely keep an eye out for it. Great review Carrie. Sounds like a good read. Glad you enjoyed it. Another great review, Carrie – I’ve tried wishing for it on NetGalley after reading your comments, fingers crossed!